I spent most of yesterday at the Bloom festival in the Phoenix Park, Dublin. It's an annual celebration of Irish gardening, crafts and artisan food & drink. The weather was so fine yesterday that 150,000 people turned up! It continues until bank holiday Monday and I recommend it highly if you want to meet the most interesting and creative Irish producers and sample their wares. I made a beeline for Stonewell Cider's Daniel Emerson to see how his plans for an apple brandy had progressed since I last met him. The great news is that the first batch of spirit is due to be distilled within days. The base cider is more or less Stonewell Dry Cider, blended from individually fermented Dabinett and Michelin apple varieties. It will then be aged in ex-Bordeaux white wine casks for a few years. Just two 250-litre casks will be filled initially but, if all goes well, there are eight more standing by in the wings. 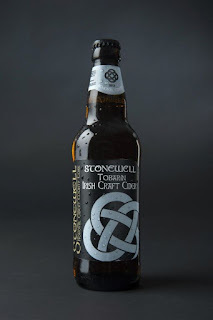 While you're waiting for the brandy to mature, you can sample Stonewell's new low-alcohol (1.5%) cider, Tobairín. The alcohol level is a consequence of the process by which it's made; it is not de-alcoholised normal-strength cider. As far as I know, it is the only such Irish cider. Both Jack Teeling and Alex Chasko are manning the stand at Bloom so it's a great chance to meet the creators behind this new and exciting whiskey company. The poitín and blend are there too, of course, in their eye-catching bottles, along with a couple of cocktails that showcase the flavours of the spirits. It was great to hear that the blend is rapidly making its way around the world. It's already on sale in Ireland, the UK, Belgium, Australia, New Zealand, Canada and various airports around Europe. It's on the point of release in Hong Kong and distribution deals are close in Russia and other parts of Europe. TWC's technical mastery of distillation and blending is clearly matched by its depth of marketing expertise. The backdrop of the TWC stand showed the forthcoming 21-year old Silver Vintage Reserve Single Malt. It's slated for bottling at the end of next week. No doubt I will have more details to report when it's finally released. The price point will be around €150. There will also be an 11-year old single malt bottled for Dublin Airport to mark The Gathering. It's due out this summer, so we should see that pretty soon. I didn't hear anything new about the distilling in Carlow but I did find out what had been done with a few Irish whiskey casks that I saw during my visit there. In 2-3 weeks' time, they will release a version of their Leann Folláin stout that has been aged for 90 days in these oak casks. Only around 2,300 numbered 750ml bottles will be produced, at 8.1% ABV. Look for it in independent off licences. I met John O'Connell, Director and Founder of West Cork Distillers. This is a company based in Union Hall in Cork that produces various whiskeys and spirits under their own brands and under contract for other companies. It was also recently revealed that the company is going to revive distilling in Bandon. There have been intriguing hints about West Cork Distillers' unique and innovative methods but I haven't been able to uncover the official story before now. Bloom was not the venue for an in depth discussion but I hope to have a longer chat with John in the near future. I had been expecting them to launch a poitín brand and I caught my first sight of Two Trees yesterday. I didn't realise that the brand would also encompass a vodka and gin. Again, I know very little about these at the moment, but I did taste the poitín and it shares a family resemblance with Glendalough, being made from malted barley and sugar beet. I always have a poke around the artisan food stalls at Bloom to see if anyone is doing anything with whiskey. 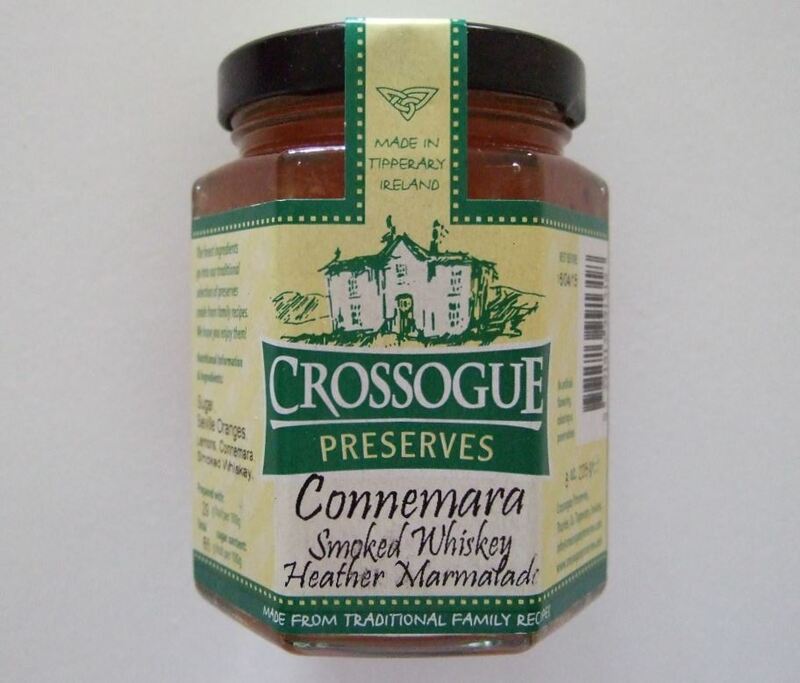 Look what I found: Connemara Smoked Whiskey & Heather Marmalade, from Crossogue Preserves. I'll be breaking the seal on this tonight.